Roundworms, tapeworms, flukes and other types of internal parasites, often referred to as worms, can cause serious problems in your cattle herd if left untreated. As a cattle owner, you need to recognize the symptoms of worms in your cattle so that you can alert your vet to medicate your herd and prevent serious worm problems from developing. A regular worming schedule can protect your cows from developing a significant parasite infection. Worms are parasites that feed off of your cows' bodies, draining nutrients out of your animals. Because cows with worms are not getting the full benefit of the nutrients that you give them, they will grow more slowly and produce less milk and smaller calves. If your cows previously produced plenty of milk and large, healthy calves but are now producing small calves and less milk, you may want to check them for worms. Simply put, a herd of cows with a worm problem can receive just as much nutrition as a healthy herd, but will be overall less productive than the comparable healthy herd. Cows who have worms tend to be in poor physical condition. Cows may be thin, have ribs showing and have a generally poor appearance. Their coats often appear dull and unhealthy. Cows with worms often continue to look poor even when you provide them with additional nutrition because the additional feed is going to the worms rather than actually benefiting the cow. Cows with worms often have diarrhea. They may be dehydrated as well as experience problems consuming and digesting their feed. Cows with severe worm infestations may become significantly lethargic or even die as a result of their poor physical condition. 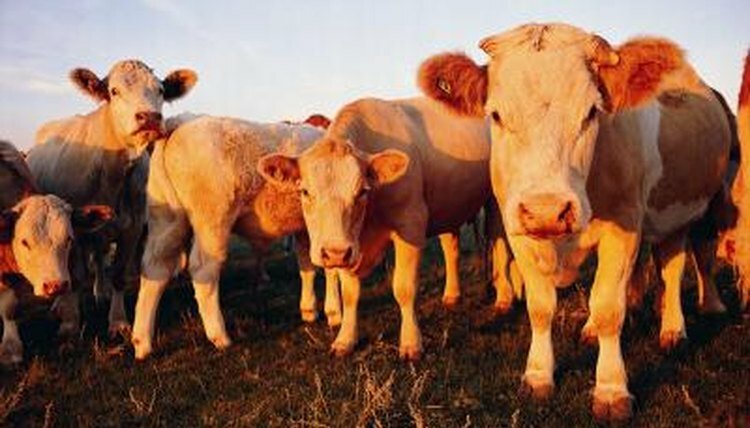 Anemia is a common problem caused by parasites that drink your cattle's blood, including worms and ticks. Over time, your cow can lose enough blood that she becomes anemic. Symptoms of anemia in cattle include pale gums, lethargy, breathing problems, lack of appetite and exercise intolerance.